They knew prison would be tough. They wanted to escape. This week, Tiranara White, 21, was on his way to prison for stealing a car and violating parole. Regan Reti, 20, was planning to spend the next two years locked-up for assault. The two were handcuffed together and were being led from the Hastings District Court in New Zeland to the prison. When Tiranara and Regan sensed an opportunity to escape, they instinctively knew what to do. They seized their chance. The two men bolted for freedom, but almost immediately, they fell over and took a shot of pepper spray. Undeterred, the two ran across the road and away from police pursuit. Unfortunately, they forgot they were handcuffed together. And they didn't think about the lamp post. In the picture, the two geniuses can be seen just before they ran on opposite sides of the post. As you might expect, the handcuffs didn't break away. As their bodies went on opposite sides of the post, their hands stayed joined. 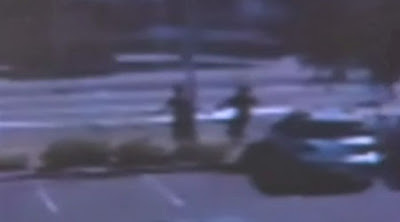 The two men slammed into one another at full-speed as their arms wrapped around the pole. As they struggled to get up on their feet, they were apprehended and taken to jail... where they undoubtedly will be spending a little extra time. This is a brilliant story!